IDid you know that there are literaly hundreds of versions of the bible? wich one is the correct one you ask? well thats the easy part, only the king james bible is the acurate and preserved word of god! "All" modern bibles have been "perverted" the following is a small list of modern corrupt bibles..The N.I.V.,the new king james version,the living bible,the new standard bible,english revised version,american standard version,good news bible,and the list goes on..
As you can see in the above "Mathew 4:4" You need an every word bible! only the original king James bible has all of gods preserved words! all these modern bibles take out, insert and totally change everything! (1) Just about everybody knows the word "Lucifer" as another name for Satan. The word "Lucifer" is found one time in the King James Bible. (2) But what about the NIV? The word "Lucifer" is clean, bald-headed gone and now this creature is identified as the "morning star". Lucifer is the "morning star" in the NIV. (3) So we know that in the NIV the "morning star" is a negative, evil figure. Right? He was fallen from heaven. He was cast down to the earth. Can we find the "morning star" anywhere else in the NIV? Yes! The following passages in the NIV show the "morning star" as Jesus Christ! But the NIV just called the fallen creature of Isaiah 14:12 "morning star". Lucifer AND Jesus are ONE in the NIV! Lord have mercy, Jesus! Help me, Lord. 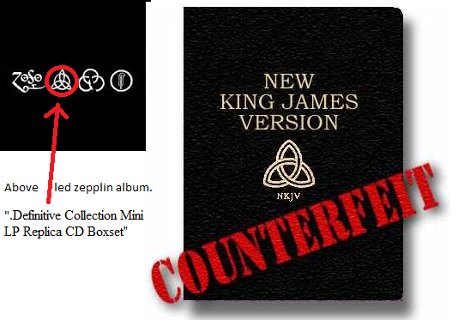 Lets take a look at another example of a modern bible below.. " The New King James Version"
notice anything funny on it? you got it!! there is an occult symbol right on the front! this is not the symbol of the trinity as some Christians may think but is in actuality the" triquetra" or occult symbol...notice the 3 interwoven 6's on it! Its also on the cover of many wicca /witchcraft and new age books! And its also found on many rock albums such as led zeppelin, for example..
click on the photo to go to a site explaining in further details! In the latter part of the 19th Century, Satan and his angels of light set out to destroy the Church by undermining its foundation, the Bible. Charles Darwin's Origin of the Species was blindly accepted as "new light on an old problem" by the scholarship of that day which had become largely obsessed with rationalism and humanism. Theories and methods of "higher criticism" and "textual criticism" were developed and couched in such scholarly language that most people failed to recognize that these were actually attacks upon the Word of God - even though carefully disguised as an effort to "supply the English reader with a more correct text of the New Testament" and to "render the New Testament more generally intelligible." The rush toward new versions was on and though the early progress was slow, we are seeing the results today. Three important issues must be understood and addressed when discussing the translation of the Bible from one language to another: first, the reliability of the document being translated; second, the knowledge and skill of the translators and third, the philosophy of translation (formal or dynamic equivalence). On all counts, the King James Bible still stands supreme. In 1881, influenced by and sympathetic to the Darwinian theory of evolution, two men, Brooke Foss Westcott and Fenton J. A. Hort brought forth a different version of the Greek New Testament - one which differed from the Textus Receptus (the underlying Greek text of the KJV) in over 5,700 places. When the first edition of Good News For Modern Man (The New Testament in Today's English) was published in 1966, the word virgin appeared in all the texts in Matthew and Luke referring to the birth of Christ. But, when the 2nd and 3rd editions were published and then the entire Good News Bible was published in 1976, the word virgin had mysteriously disappeared from Luke 1:27 while remaining in Luke 1:34 and Matthew 1:23. Of course, the latter two verses have no meaning at all if the word virgin is removed or replaced. Also, the blood of Christ, a most important and precious word and theme, was lacking in many key New Testament references. It was replaced by "death" or "costly sacrifice," both good words in their own place but not what the Holy Spirit gave in the original text. The heretical views of the main translator, Dr. Robert Bratcher, help to explain the many places in which the Deity of Christ is played down or omitted. The Good News Bible is one of the worst versions, yet it has been distributed by the millions, largely due to endorsements by Billy Graham, Bill Bright and other evangelical leaders. This is neither a translation nor a version - it is a paraphrase. The Living Bible, praised by Billy Graham and other New Evangelical leaders, has reached a publication figure of 37 million copies and has made its author, Ken Taylor, a wealthy man. It is very readable, but at the expense of truth in so many places. Taylor admits that the principle he worked from was not a "word-for-word" translation but rather a "thought-for-thought" paraphrase which he called, "dynamic equivalence." Taylor said he worked for the most part from the ASV of 1901, a corrupt translation to begin with. The Living Bible decimates the Scriptures, almost completely eliminating important and precious words and truths as grace (see John 1:17; Acts 4:33, 15:11, 20:24; Romans 3:24; 2 Corinthians 9:8; Ephesians 2:8-9; Jude 4) and repentance (see Matthew 9:13 and Acts 17:30). "Honor" is substituted for "begotten" in Acts 13:33, Hebrews 1:5 and 5:5. Significant changes are made regarding such matters as creation in Genesis 1:1-2 and a prophecy of Christ in Zechariah 13:6. The meaning of Romans 8:28 is changed completely. Vulgar language is used in John 9:34, 11:39 and 2 Kings 18:27. The language of 1 Samuel 20:30 in early editions of TLB shocked many but it has now been softened. The author has left the door open for further suggestions, corrections and clarifications. Who knows what future editions may contain? The NASV was to be the Bible for conservatives, Evangelicals and Fundamentalists. The foreword states that the NASV "has been produced with the conviction that the words of Scripture as originally penned in the Hebrew and Greek were inspired of God." The basic problem with this translation, however, is revealed in this statement: "This translation follows the principles used in the American Standard Version 1901 known as the Rock of Biblical Honesty." Who gave the ASV such a title? In the Principles of Revision, it is stated: "In revising the ASV consideration was given to the latest available manuscripts with a view to determining the best Greek text. In most instances the 23rd edition of the Nestle Greek New Testament was followed." This gets right to the heart of the major problem with the modern Bible versions - most are patterned after the corrupted Westcott-Hort Greek Text rather than the Textus Receptus. The word virgin does appear in Isaiah 7:14, but a footnote says, "or, young woman"- no doubt a sop to the liberals. Verses like Matthew 18:11 and Matthew 23:14 appear in brackets with a footnote saying, "most ancient manuscripts omit this verse" or, "this verse is not found in earliest manuscripts." A corrupted Greek text thus becomes the basis for raising questions about the entire verse In other instances as in Luke 24:40, the number of the verse appears followed by "see marginal note" which explains that "some ancient Mss. add verse 40." One wonders if the NASV translators were determined to list everything anyone ever added or left out of a manuscript until one discovers that some parts of verses are left out with no explanation whatsoever as in Colossians 1:14 and 1 Timothy 6:5. It is sad to see so many conservatives pushing this version and criticizing the KJV. Like the NASV, the NIV was produced by those who are said to "hold a high view of Scripture." Sponsored by the New York Bible Society, they admitted the NIV translators represent a "broad spectrum in evangelical Christianity" and the list of names confirms the broadness of the spectrum. Instead of being a revision of a previous version, the preface says, "It is a completely new translation made by many scholars working directly from the Greek." The Greek text used is an "eclectic one." that is, the translators mixed different texts supposedly in "accord with sound principles of textual criticism." However, they did not state what those principles were - and much of the previous undermining of the Scripture has been done on the supposed basis of "sound principles of textual criticism." Examining the text, you find that the NIV leaves out many of the same verses and portions that the ASV and the NASV also omit. An added problem, however, stems from the fact that where an entire verse is omitted, even the verse number is missing and only a small letter refers to a footnote of explanation. A careful study of this version confirms what one Christian leader said several years ago, "For every verse or word clarified in these new translations, two new problems are created." We agree with his statement. In a critique of the New International Version, one Fundamentalist scholar correctly objected that "words were dropped out; words were added; and key words were sometimes changed." Yet, the same objection must also be raised concerning the New American Standard Version which this same Fundamentalist scholar defends and recommends. This objection - the deletion or addition of words-also applies to all the other modern versions. We still insist on using and recommending only the Authorized Version. Although the NKJV uses the underlying Textus Receptus Greek text, the translators repeatedly use marginal notations to reference the Modem Critical Text upon which all of the modem versions are based. The NKJV advocate opens a door that lends credibility to a perverted underlying text used by all the other versions. Furthermore, changes in the text are made which simply are not warranted. The NKJV primarily uses the 1967/ 1977 Stuttgart edition of Biblia Hebraica and draws from sources which result in a Hebrew text that is different from the Jacob ben Chayyim text underlying the KJV Old Testament. As a result the NKJV preface rightly stated, "significant variations are recorded in footnotes." We believe the potential for most textual problems and variants between the KJV and NKJV will be found in the Old Testament. The written Word of God is our final authority in all matters of which It speaks, for It is God's final revelation to man. The Bible is God's trustworthy, authoritative Book, and no more is to be added thereto. The Holy Spirit supernaturally inspired the writers of the 39 books of the Old Testament to record the very words God desired His people to possess (2 Pet. 1: 2 1). Likewise, the prophetic promise Jesus Christ made to His disciples (soon to be the apostles and writers of the 27 books of the New Testament) restated the same divine operation of inspiration, for the Holy Spirit later also guided these men "into all truth" (Jn. 16:12-15). "All Scripture is given by inspiration of God" (2 Tim. 3:16, 17), and that inspired Scripture encompasses nothing more, nor anything less, than the 66 books of the Bible, the completed canon of Scripture. 2 Peter 3:2 tells us that if we want to know God's Word, then we are to look nowhere other than to the "words which were spoken before by the holy prophets [O. T. Scripture], and of the commandments of us the apostles of the Lord and Saviour [N.T. Scripture]." God's Word provides us with all we need to be built up in the faith and to do God's will and work - God gave no additional revelation once the Bible was completed. The inspired writings of the apostles, circulated among the churches and later canonized, were perfect and complete (Lk. 1: 1-4; 1 Cor. 14:37; Eph. 3:1-7; 1 Thess. 2:13; Rev. 22:18, 19). The internal evidence of the Word of God states without equivocation that believers today have a final authority - God's Written Word. Since the completion of the canon of Scripture, no additional divine revelation has come through any "latter day prophets," charismatic dreamers, cult authorities or the tradition/Magisterium of the Roman Catholic Church, as Pope John Paul II has reinforced in a recent encyclical. With the passing of the original disciples of the Lord Jesus Christ (the apostles who penned the 27 books of the New Testament), the partial revelation ceased and "that which is perfect"-the Written Word of the Living God-was come. "That which is in part" was done away (1 Cor. 13:8-12). With the passing of the apostles and the subsequent completion of the canon, no more revelation came from God. It is essential, therefore, that we earnestly contend for the faith "once delivered" (past tense) and against any attempt to claim an authority for faith and practice other than God's Word, the 66 books of the Bible. Remember, Timothy's household did not have the "original autographs," but the copies they had were designated by God as "the holy scriptures" (2 Tim. 3:14, 15). Likewise, Paul commended the Ephesian elders to the "word of his grace, which is able to build you up..." (Acts 20:27, 32). We can have confidence today that we have a Bible that is the holy Word of God in the Authorized (King James) Version. A problem developed, however, with the 20th century's proliferation of new Bible versions. It became necessary to study the history of the English Bible and the Greek text which had been used down through the centuries and compare that text with the claims of the "higher critics" who championed the minority text upon which the new versions are based. After careful study of the subject, the FEA concluded that the Textus Receptus, the underlying text upon which the Authorized King James Version is based, is the providentially preserved Greek text. The Textus Receptus was derived from the majority family of manuscripts used in the Greek-speaking church down through the centuries. This text was the divinely preserved text - an accurate rendition of the very originals (miraculously inspired by the Holy Spirit) written by the apostles, and, in the Hebrew tongue, by the Old Testament prophets. The Masoretic text of the Old Testament and the Textus Receptus of the New Testament are, in reality, the divinely preserved texts of the divinely inspired original writings. But now, another problem has arisen within the last few decades. An element of those who were strong defenders of the inerrancy and veracity of the Authorized Version, used and blessed by God in the English-speaking world for well over 300 years, began to advance the idea that the KJV English translation is superior to the Greek and Hebrew texts and that the King James translators were themselves inspired by the Holy Spirit in producing their translation. As a result of this proposal, they claim that the English King James translation has been miraculously inspired just as the original autographs themselves were inspired. This false teaching even assumed the newly ascribed authority to correct the underlying Greek and Hebrew text from which it was translated. What we have by this proposed phenomenon is what is often known as "double inspiration" - the original writings of the prophets and the apostles consist of the first "inspiration," and the second work of "inspiration" occurred when the King James translators produced the English Authorized Version in 1611. Certainly the King James translators were the best scholars ever assembled to produce a translation that we can hold up today as our authoritative, trustworthy translation; but were those esteemed translators "inspired" in the biblical sense? Absolutely not!